Curry Tree (Murraya Koenigii) other names : Curry-leaf tree , Curry Tree. 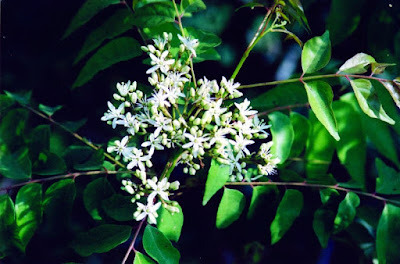 Found naturally growing in the regions between the tropics and sub-tropics and indigenous to India, the curry tree belongs to the family Rutaceae. Curry tree grows to a height of anything between 4 meters and 6 meters (13 feet to 20 feet) and its trunk measures about 40 cm across. Curry tree bears pinnate leaves having about 11 to 21 leaflets, each of which measures 2 cm to 4 cm in length and they are 1 cm to 2 cm in width. The curry tree leaves are very aromatic. The flowers of curry tree are small, white-hued and scented. It produces tiny black glistening berries which are safe for consumption. 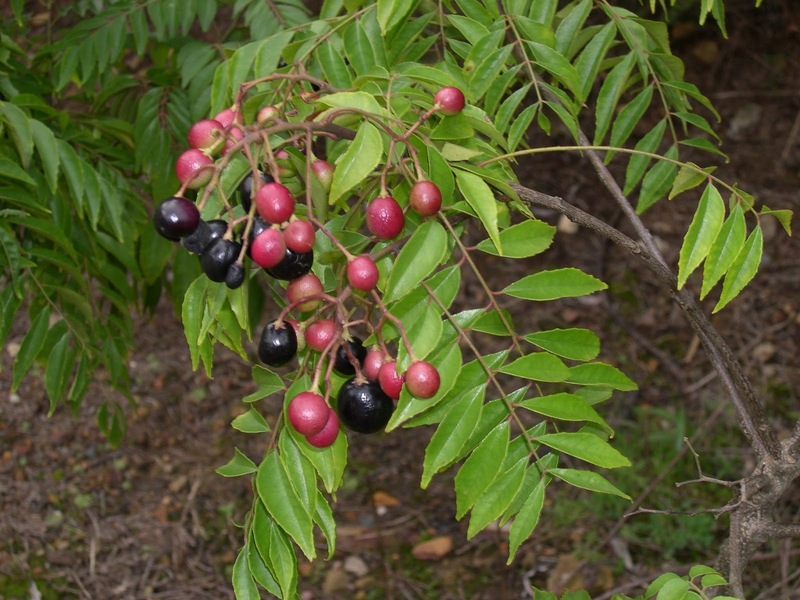 However, the seeds of curry tree are poisonous. People in India as well as its neighbours use the curry tree leaves in several dishes. 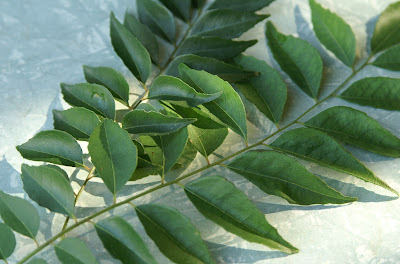 As they are used in curries often, the leaves are commonly known as ‘curry leaves’. However, when translated, in nearly all Indian languages, the name of these leaves denote ‘sweet neem leaves’. On the contrary, the leaves of the original neem have a bitter taste. The curry tree has its origin in India and is commonly found growing in places having tropical as well as sub-tropical climates. Apart from India, this species is grown in a number of other countries like China, Sri Lanka, Australia and Nigeria. These plants grow up to a small to medium height. The aromatic leaves, bark as well as the roots of the curry tree are the most valuable parts of this tree. Curry tree prefers a place where temperature is warm and receives complete sunlight or is in a partially shaded place. Curry tree is generally proliferated by growing little suckers cut from the tree’s base. This species is never propagated by means of root cutting or its seeds. Curry leaves have numerous uses - in culinary as well as medicine. These leaves, which enhance the flavour of the dishes they are added to, provide us with several health benefits. Hence, adding the aromatic curry leaves to preparations not only makes the food tasty, but also enriches the food. Curry leaves enclose a variety of antioxidants and are helpful in controlling gastrointestinal disorders like surplus secretion of acids and indigestion, diarrhea, dysentery, peptic ulcers, and also diabetes as well as harmful cholesterol balance. In addition, it is believed that curry leaves also possess therapeutic properties that help to combat cancer. These aromatic leaves are also useful for protecting the liver. According to the ancient Indian medicine stream Ayurveda, curry leaves are known to possess numerous therapeutic qualities, including antioxidant, anti-inflammatory, and anti-diabetic, anti-microbial, anti-carcinogenic as well as hepato-protective (the ability to save the liver from harm). Ayurveda also employs the roots of the curry plant to treat body aches, while the bark of this tree is known to provide relief from snake bites. Laboratory experiments on rodents demonstrated that carbazole extracts from the curry leaves were significantly effective in controlling diarrhea induced by giving them castor oil. Findings of another study have suggested that the curry leaves are also an excellent natural antioxidant source. In addition, curry leaves or Murraya Koenigii also contain an assortment of vitamins, including vitamin A, B, C and E, which are useful in diminishing the oxidative stress as well as scavenging the detrimental free radicals. If you wish, you can include curry leaves in your curries, soups and vegetable stews. Apart from the fresh leaves, they are also available in desiccated powdered form. In Ayurveda, it is recommended that curry leaves should be used to treat gastrointestinal problems. One significant reason for this is perhaps because the curry leaves have gentle laxative attributes. The ability of curry leaves to control diabetes is possibly one of the most important health benefits offered by curry leaves. In addition, curry leaves are also said to lower the levels of LDL cholesterol, also called ‘bad cholesterol’, in the bloodstream. Curry leaves also enclose elevated quantities of vitamin A and, hence, are excellent for the health of our eyes, especially in enhancing eyesight. Carotenoids are present in vitamin A and these natural compounds are helpful in shielding the cornea, which forms the surface of the eye, from damage. People who suffer from vitamin A deficiency are likely to endure night blindness, formation of cloud-like images in front of their eyes and, in some cases, may even suffer vision loss. Several natural chemicals like phenols are also present in curry leaves and these are effective in combating various forms of cancer, including colorectal cancer, leukemia and prostate cancer. Researches involving the extracts obtained from curry leaves have demonstrated that they are useful in diminishing the adverse effects of radiotherapy and chemotherapy. At the same time, they are effective in putting off any chromosomal damage, saving bone marrow from harms and in impeding the free radicals from turning out to be vigorous in our body. Other studies conducted on curry leaves have shown their effectiveness in combating bacterial as well as fungal infections. If not more, the extracts from curry leaves are as popular as the antibiotic drugs used in conventional medicine. As we are all aware, the proper functioning of the liver is extremely vital in the digestive system. Therefore, it is essential to protect the liver from all invasions by free radicals and also from bacterial and viral onslaughts, which may cause infections. Findings of many studies on curry leaves have suggested that the carbazole alkaloids and tannins enclosed by curry leaves possess excellent hepato-protective qualities. In addition, these aromatic leaves are also useful in shielding the liver from numerous ailments, for instance, cirrhosis and hepatitis. It is believed that curry leaves are also helpful for making the hair roots stronger. It is recommended that you prepare a mixture of dried out curry leaf powder and hair oil and apply it to your hair by massaging the combination quickly. People who are bothered with greying hair may also make a paste from curry leaves and apply it to their hair. People, who do these regularly, may also find that it helps in promoting hair growth. Although it may seem to be incredible to many, curry leaves also facilitate skin care. You may apply the juice of the leaves or a paste prepared using these fragrant leaves on the skin affected by cuts, bruises, burn injuries, skin irritations as well as insect bites for clean healing and speedy recovery. In addition to their therapeutic values, people in southern as well as west-coast India and Sri Lanka consider curry leaves to be excellent seasoning agents that add much essence to their dishes, especially curries. Generally, curry leaves are fried together with sliced onions during the initial phase of preparing a dish. In addition, people also employ curry leaves to prepare vada, thoran, kadhi and rasam. Fresh curry leaves do not have a long shelf-life and they cannot be stored properly in refrigerators too. You may also purchase dried curry leaf powder, but its aroma is not very potent. While curry leaves are mainly used in curries, from where they derive their common name, they can also be added to several other preparations to enhance their essence. Khmer or Cambodians toast or heat up curry leaves over an open flame or roast them to make the leaves crunchy. Subsequently, they crush these leaves and add them to a soup, which they call ‘Maju Krueng’. In many places, people also use curry leaves as a substitute for ‘tulsi’ (holy basil) in ritual ceremonies and pujas (prayer meets). This is specially done when tulsi is not available. In south Indian as well as Sri Lankan culinary, curry leaves are also valued highly for their excellent seasoning properties, especially when preparing curries using coconut milk or fish. These aromatic leaves are valued no less than bay leaves, which are used for seasoning preparations in the West. Besides India and Sri Lanka, people in Pakistan also use curry leaves as an important ingredient of their popular dish called ‘karhi’.